It is almost impossible to get a featured outdoor without adding proper furniture there! Some functional furniture design can add a vibrant behavior to your paved outdoor but to miss it would be just like to make your patio look awkward or a lifeless place! 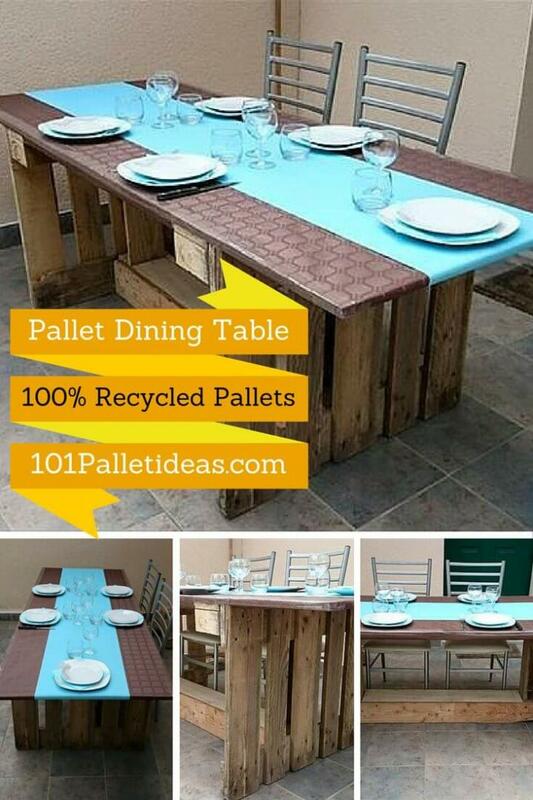 You not need to consume very much of your effort or budget to get adorable sitting piece of furniture for you green garden or open courtyards, just a little reprocessing of pallets can make you get with all, you need to organize for a better outdoor! 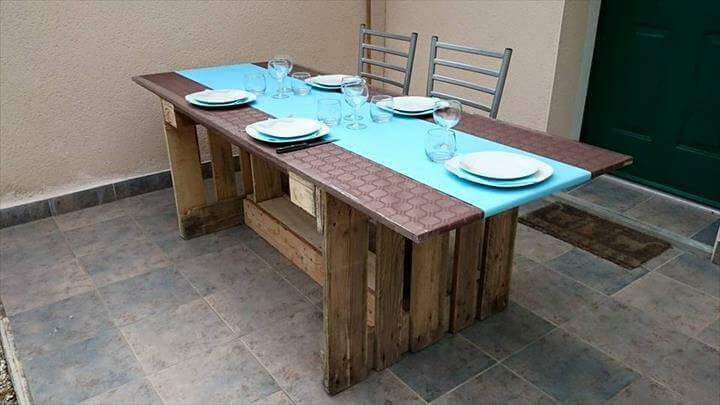 Today we’ll like to share a much more creative pallet achievement, this grand DIY outdoor pallet dining table, has capacity to accommodate 8 people for dinner and of course for fun and gossips too! Construction is just timeless or super handy and quick one! Use a ceramic tile slab or MDF plate as top and cut one pallet board into halves to put the sturdy legs to it! The long cross beam support is just to create extra stability to legs and would surely make it live longer! After getting the necessary supplies, you can simply clone it home or other pallet made furniture, if you are not in mood just want to buy it then this choice is also available for you! 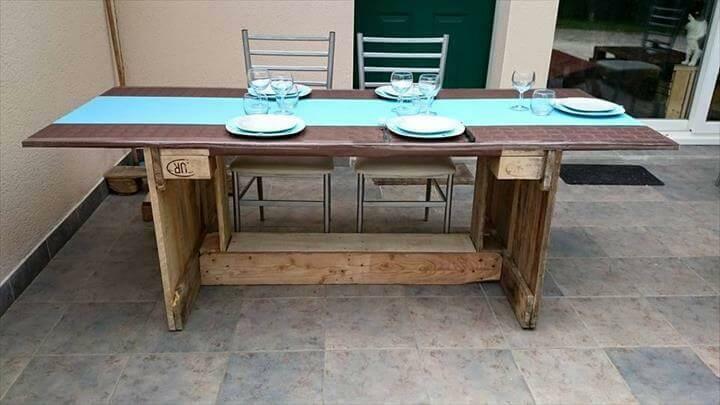 Need an outdoor dining table for BBQ feasting and summer after night dinners? 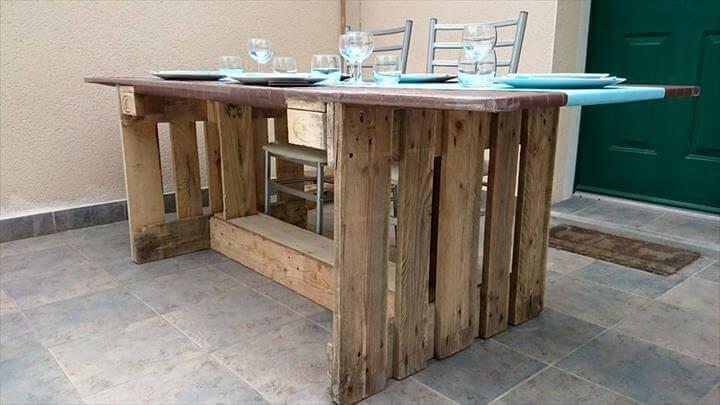 Try this one made of pallets and MDF palte! 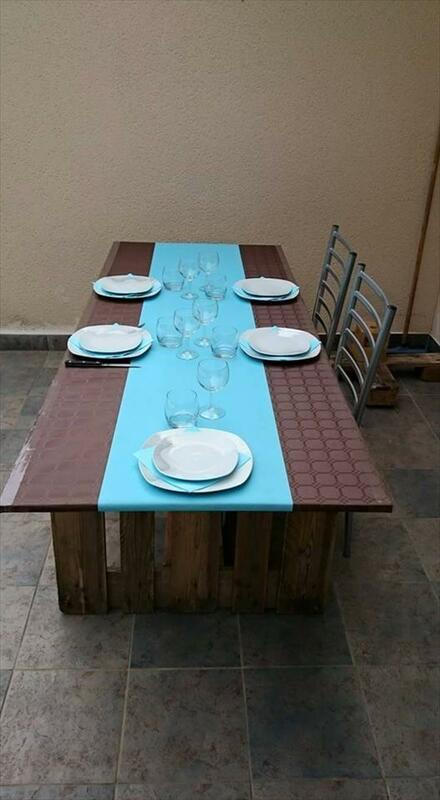 Treat the pallets with MDF plate for a beautiful and lasting dining table! Grand rectangular top is of MDF plate and can stay last with its chic and enticing appeal! 1 pallet board cut into haves has been used to give legs to table and a longer cross beam support would make it live much longer!